A distant voice is calling him home. After the loss of his father a troubled man Daniel (Roberto Scorza), follows his inner voice to his childhood home. Seeking to exist on another level of being, Daniel begins a night of self-enlightenment, both figuratively and literally as he summons the Goddess Ishtar (Flora Giannattasio) by the sacrifice of his own body parts in her name. Is this a maddening of the mind or an ascension of the soul? To find out may cost him the ultimate Sacrifice. 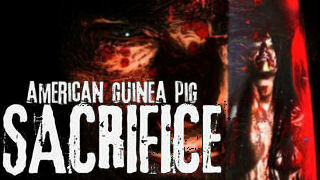 The latest addition to the American Guinea Pig series is an hour long epic of self-mutilation. An Italian film on a ten thousand dollar budget was deemed brutal enough to be given the American Guinea label. What starts with a hand ends with your soul, losing a couple of important body parts on the journey to enlightenment. A cast of basically one with no dialogue is brilliantly if not annoying voiced-over making it easily translatable to any language. An exploration of self-mutilation that rivals the BME Pain Olympics. It’s brutality at is best. Sure to please any man haters, even those men who hate themselves. 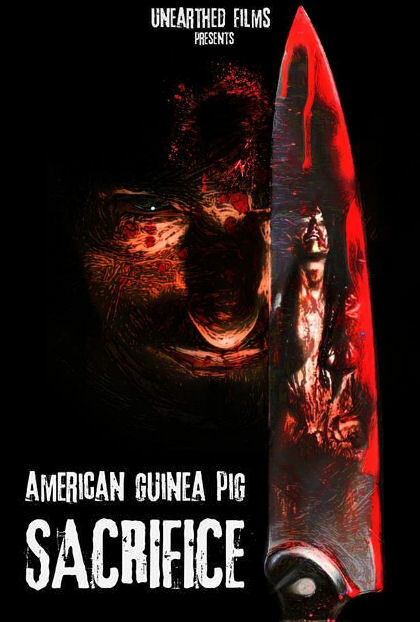 Gore hounds are given exactly what they love about the American Guinea Pig series in this one. For the rest of you a hour of straight self-harm will be a little much. Those who like a little more story with our daily dose of dismemberment may have a hard time sitting through this one. By the time you realize what this Sacrifice is all about you’ll think, “It’s too late to go back now, I must finish the book.” Luckily you’ll have to watch the ending because the payoff is worth the hour of cringing to get there.